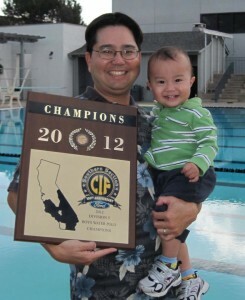 PASADENA — Pasadena Polytechnic water polo coach Ryan Katsuyama has been named the All-California Interscholastic Federation’s coach of the year. Katsuyama, who led the Panthers to their first-ever CIF Southern Section Div. 5 championship, was also named to The Pasadena Sun’s All-Area team. Poly has won the Prep League title in boys’ water polo three straight seasons under Katsuyama. Seven of Katsuyama’s players were chosen for the All-CIF team, including junior Spencer Rogers, who was named the division’s player of the year. Poly had advanced to the title game the past two seasons, only to be turned away, but this year was different, as the Panthers scored six goals in the fourth quarter to secure the championship. After graduating from USC, Katsuyama in 1995 returned to his alma mater Poly (Class of 1990) to head both the boys’ and girls’ water polo teams.